The St John’s Cathedral (Sint Jan) in Den Bosch is one of the largest and most impressive Gothic churches in The Netherlands. The Kathedrale Basiliek van Sint-Jan Evangelist (Basilica Cathedral of St John the Evangelist) dominates the skyline of the old town of ‘s-Hertogenbosch in North Brabant in the south of The Netherlands. It is one of the largest and most interesting Gothic churches in the Dutch-speaking world with many decorations and unique features. The towers may be climbed on guided tours most summer afternoons. The cathedral of ‘s-Hertogenbosch partly dates back to the early-13th century when a parish church dedicated to St John the Evangelist was built in the newly founded town ‘s-Hertogenbosch in the Duchy of Brabant. To reflect the town’s wealth and increased status of the church, which became a collegiate church in 1366, a new Gothic church was built from around 1370 onwards to systematically replace the Romanesque original. It only became a cathedral in 1559. The Gothic choir was completed by 1415 and the transept by 1470. Subsequently, most of the original Romanesque church was demolished and replaced by a Gothic nave. However, money and interest ran out – the bases of the Romanesque towers were kept requiring the new nave to be shorter than originally planned. This can be seen by the narrower windows towards the western end of the nave. The Gothic church was in use by around 1530. A major fire in 1584 destroyed the organs and the central tower over the crossing, which was subsequently replaced by a cupola. The western tower was damaged by fire in 1830 and a new canopy added. However, the bells and carillon hang in 14th century clockwork. Less than a century after the completion of the Gothic church, Spanish-ruled ‘s-Hertogenbosch fell to the protestant Dutch and the church became protestant, even though the city remained overwhelmingly Roman Catholic. Most of the interior decorations were subsequently removed or destroyed – beeldenstorm (literally “storming of the statues” but usually translated into English as “iconoclastic fury”) was big in The Netherlands. In 1810, through the intervention of Napoleon Bonaparte, the church returns to the Roman Catholic community. In 1985, the cathedral was designated a basilica minor. The floor plan of the cathedral show a central nave with double side aisles that go over into an ambulatory after thes wide transept. At 29 m, the central nave is not particularly high but in keeping with other Brabant Gothic designs. The Sint-Janskathedraal in ‘s-Hertogenbosch is one of the largest and most impressive Gothic buildings in The Netherlands. It is richly decorated although much of the decorations – especially the interior and stained glass – are from the nineteenth century after the church returned to the Roman Catholic community. 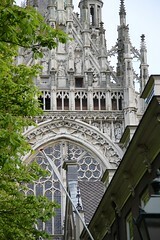 The building style can be defined as Brabant Gothic – the church had little influence on religious buildings in the modern-day Netherlands but show great conformity with other major churches in Belgian cities previously part of the Duchy of Brabant such as Antwerp, Mechelen and Leuven. The double row of flying buttress supporting the choir and nave are extremely rare in The Netherlands. The 96 figures sitting on the flying buttress are truly unique features of this church. However, none of these figures are original – most were crafted during the nineteenth century based on originals and drawings, while a few were new creations. Some of the figures are in museums – locally and in the Rijksmuseum Amsterdam. These statues sitting on the flying buttresses are hard to see clearly from street level. Cubra (Dutch only) has close-up photos of all 96. The church also has a remarkable number of statues on the wimpergs, on reliefs and inside the church. In total around 600 statues decorate the church. These include a few originals, many later copies as well as new creations – the most famous is an angel dressed in slacks with a cell phone sculpted in 2010 by Ton Mooy (the church authorities nixed the jet pack he intended for wings). Statues of the Dukes of Brabant, as well as the Carolingian rulers, are on the wimpergs and flying buttresses supporting the choir. 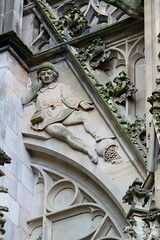 Church and biblical figures feature prominently elsewhere as do locals – depicted as fairly unsophisticated wild men. A famous scene on a relief is the erwteneter (pea eater) – according to legend a building master kicked over a bowl of peas, as he thought it below his standing to eat such simple food. He was subsequently driven out of town, as the Dutch abhorrence of looking down on others has a long tradition. Much of the art of the cathedral was lost during the 17th-century but several statues only “disappeared” later on. The sale of the 1611 marble root screen in 1866 – now in the Victoria and Albert Museum in London – caused such a controversy that it led to the foundation of an official body to preserve Dutch monuments. 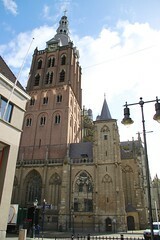 The cathedral is classified as a rijksmonument – or national monument – and of such important that it receives state money for its upkeep even though it is a working religious building. Although much of the art was lost or removed after the protestants took over, some works survived or were returned. The windows and much of the interior decorations are nineteenth century but art from the 15thcentury include the choir stalls, the baptismal font and altar. The Mary statue is from the 13th century while the Renaissance pulpit is from the mid-16th century. The large organ is from 1620 and considered one of the most important historical organs in The Netherlands. The interior was mostly whitewashed during the protestant period and although art and decorations have returned, the cathedral is still much brighter and simpler than similar churches in Belgium such as in Antwerp and Mechelen. Some medieval frescoes have been recovered after recent restoration projects – some may be by Hieronymus Bosch, who was born here, but no one can say for sure. ‘s-Hertogenbosch is a lot easier to say when bearing in mind that, as in English, the apostrophe and dash have no bearing on the pronunciation. Alternatively, like many locals, simply say Den Bosch – only the society for the promotion of the official name ‘s-Hertogenbosch is likely to object. ‘s-Hertogen means “the duke’s” and Bosch = forest – Den Bosch simple means (at) the forest. In some languages the name is thus translated, e.g. in French it is Bois-le-Duc and sometimes in German Herzogenbusch. The Hague similarly can be called Den Haag (the hedge) or ‘s-Gravenshage (the count’s hedge) – both names in this case are official. The Sint Janskathedraal is generally open daily from 8 am (9 am on Sunday) to 5 pm. Sightseeing is restricted during services making mid-morning (10-11:30) or mid-afternoon (1:30-4 pm) the best times to visit to ensure that the whole cathedral is open. Admission is free, as the church is still a working Roman Catholic cathedral. It is possible to scale the 73-m high tower and see the carillon in addition to marvelous views but only on guided tours. These tours depart from April to October from Tuesday to Sunday at 1 and 3 pm (also at 2 pm on Saturday). Tours start at the tower but tickets should be bought from the Kringhuis, Parade 12, on the opposite end of the big square next to the cathedral. Admission is €5 (€2.50 for children 4 to 12). 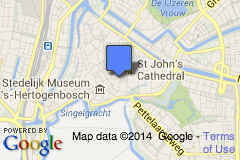 St John’s Cathedral is a pleasant 15-minute walk from ‘s-Hertogenbosch train station. Much of the old town of Den Bosch is car free or with very restricted parking. If arriving by car, use a formal parking garage at the edge of the old town and walk. 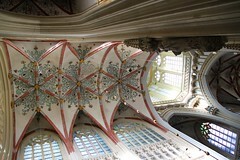 More photos of ‘s-Hertogenbosch and St Janskathedraal on Flickr. 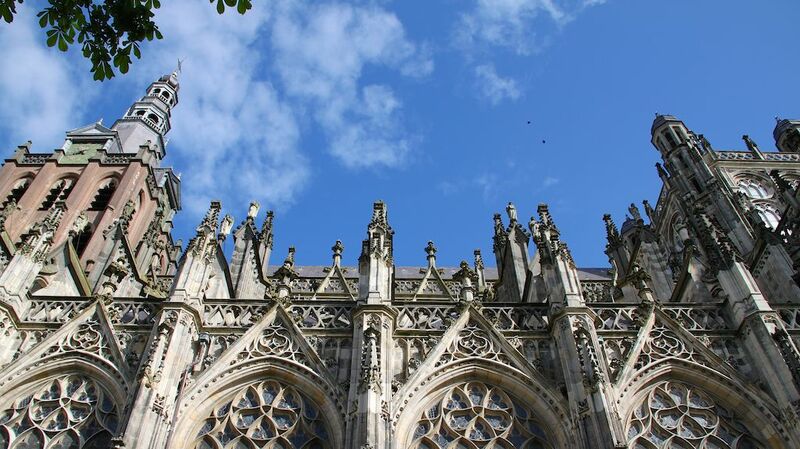 City Guide to ‘s-Hertogenbosch on Netherlands Tourism.